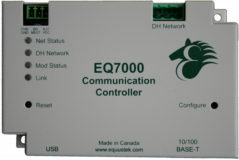 Our expertise is interfacing PC’s, SCADA Systems, A-B PLC’s, SLC’s, computers, modems, variable speed drives and OEM equipment to Modicon’s Modbus, Allen Bradley Data Highway Plus (DH+), DH485, and Remote I/O. We also develop adapters that interface Industrial Ethernet (Ethernet I/P, TCP/IP, Modbus TCPIP), Profibus, and DeviceNet protocols. To provide industrial automation solutions & industrial automation services for integrators and manufacturers for their present and future communication challenges. Equustek Solutions’ engineering team is dedicated to designing and implementing superior solutions to meet ever-changing industrial demands in the shortest time frame possible. Our size and flexibility allows a quick turn around from the design stage to production.